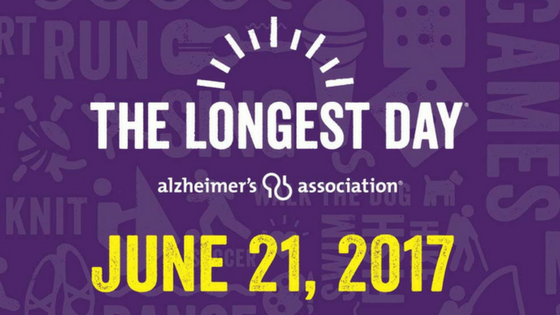 On the longest day of the year — the summer solstice on June 21 — you’re invited to team up with the Alzheimer’s Association to help end Alzheimer’s. The Longest Day is an event all about love. Love for those affected by Alzheimer’s. The Alzheimer’s Association invites you to join with family and friends across the country and the world to raise funds and awareness to help end Alzheimer’s disease. More than 5 million Americans are living with Alzheimer’s today. By 2050, this number could rise as high as 16 million, according to the Alzheimer’s Association. Every 66 seconds, someone in the United States develops Alzheimer’s. It is the sixth leading cause of death in the United States. Together, with the Alzheimer’s Association, you can help raise awareness for care and support while advancing research toward finding a cure. Pick a way to participate. Start or join a team, host an event, or register as an individual. Choose the way that works best for you! Plan your day. If you’re hosting an event or participating as part of a team, get organized now — send invitations, organize supplies and strategize for the big day.